Multiple ports bundled together such that they appear as a single port. Port Channel runs between 2 devices. Port Channel utilizes LACP (Standard) or PAgP (Cisco Proprietary). Multiple ports bundled together such that they appear as a single port. In the case of vPC, the links are connected to two different Cisco Nexus devices and appear as a single Port Channel to a 3rd device. vPC – Port Channel between vPC peer and the downstream device. 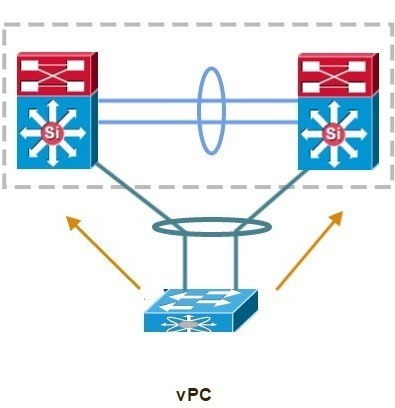 vPC Domain – Pair of vPC Switches. vPC Peer – A vPC switch in a common vPC Domain. vPC Member Port – One of a set of ports to form vPC. vPC Peer Keepalive Link – Keepalive link between vPC peer devices. vPC VLAN – Any of the VLANs carried over the vPC Peer Link. Orphan Device – A device on a vPC VLAN but only connected to only one vPC Peer and not both. Orphan Port – An orphan port is a interface that connects to an Orphan Device.